FINE APPEARANCE. 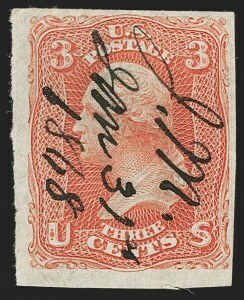 A RARE EXAMPLE OF THE 3-CENT SCARLET WITH THE NEW YORK CITY OVAL DUPLEX CANCELLATION. ONLY A VERY SMALL NUMBER OF THIS ISSUE WERE ACTUALLY SENT THROUGH THE MAILS. As documented by Jerome S. Wagshal in a series of Chronicle articles (Nos. 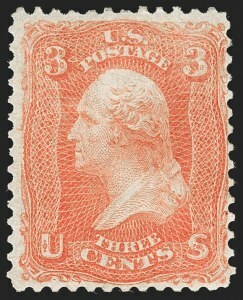 56, 60, 61 and 62), Carl F. Rothfuchs, a Washington D.C. stamp dealer, obtained a supply of the 3c Scarlet in 1893 -- probably from the Post Office Department in exchange for his assistance with the Columbian Exposition -- and sold them with pen marks and original gum. 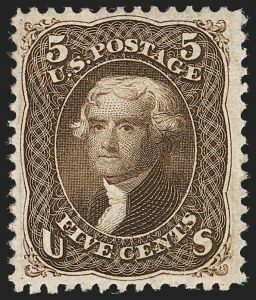 A small number were also used by J. W. Scott, who posted letters with some of his supply to validate his claim that these stamps were legitimate postage. Today, there are perhaps five copies cancelled in this manner. We offered one in 2001 (Twigg-Smith collection), another in our sale of the Wagshal collection and one in our auction of the Curtis collection. Ex Natalee Grace and "Golden Oak". With 1994 P.F. certificate. FINE APPEARANCE. 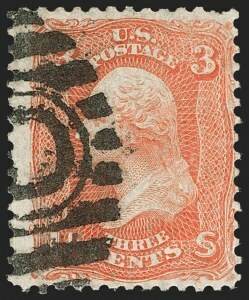 A RARE EXAMPLE OF THE 3-CENT SCARLET WITH A NEW YORK CITY OVAL DUPLEX CANCELLATION AND THE ONLY RECORDED EXAMPLE WITH THE "PO" INSTEAD OF STATION "D". ONLY A VERY SMALL NUMBER OF THIS ISSUE WERE ACTUALLY SENT THROUGH THE MAILS. As documented by Jerome S. Wagshal in a series of Chronicle articles (Nos. 56, 60, 61 and 62), Carl F. Rothfuchs, a Washington D.C. stamp dealer, obtained a supply of the 3c Scarlet in 1893 -- probably from the Post Office Department in exchange for his assistance with the Columbian Exposition -- and sold them with pen marks and original gum. 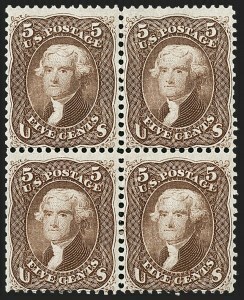 A small number were also used by J. W. Scott, who posted letters with some of his supply to validate his claim that these stamps were legitimate postage. Today, there are perhaps five copies cancelled in this manner, but this is the only one we record with the "PO" cancel. The others have Station "D", as seen in lot 162. VERY FINE APPEARANCE. 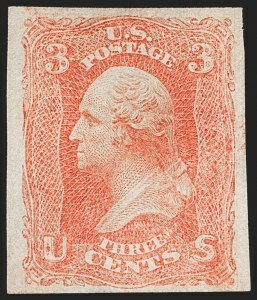 AN EXTRAORDINARY EXAMPLE OF THE IMPERFORATE 3-CENT SCARLET PRINTING -- ONE OF FOUR RECORDED WITH JAMES MACDONOUGH'S MANUSCRIPT INITIALS AND DATE. The story of the 3c Scarlet has been well-documented by Jerome S. Wagshal in a series of articles appearing in the Chronicle (Nos. 56, 60, 61 and 62). Wagshal quotes statements made in 1893 and 1910 by a Washington D.C. stamp dealer, Carl F. Rothfuchs, to the effect that Rothfuchs obtained a supply of the 3c Scarlet in 1893--probably from the Post Office Department in exchange for his assistance with the Columbian Exposition--and sold them with pen marks and original gum. 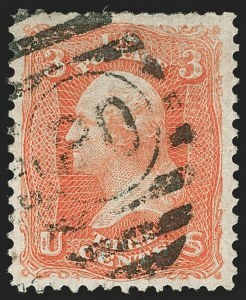 The Rothfuchs lot is not from the same supply acquired by John W. Scott in the late 1870's, from which stamps exist uncancelled and cancelled with a New York City Station D oval. We record four examples of the 3c Scarlet with the initials and date: one perforated and three imperforate, including one example in a pair. The "J.M. Jan. 31, 1868" was probably applied by James Macdonough, one of the National Bank Note Company founders. Although Wagshal offers some evidence dating the Scarlet to 1861, these 1868-dated examples suggest an alternate theory that the Scarlet was produced about the time of the 1868 regular-production grills. 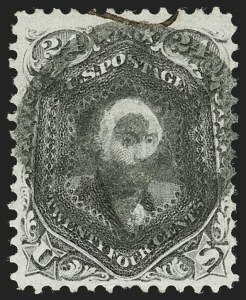 The existence of numerous essays and color varieties made in 1867 and 1868, as well as actual changes in the color and paper of stamps produced in 1868, show that National was experimenting with various means to prevent stamp re-use and to improve production efficiency and quality. The Scarlet may be related to this effort. FINE CENTERING AND BRILLIANT COLOR. 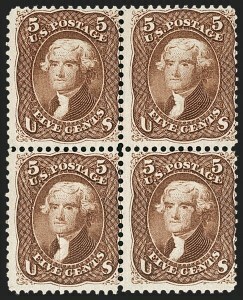 ONLY TWO UNUSED BLOCKS OF THE 5-CENT RED BROWN ARE KNOWN, BOTH SIMILARLY CENTERED. FINE APPEARANCE. 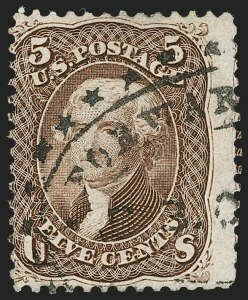 ONE OF THREE RECORDED USED BLOCKS OF THE 1862 5-CENT RED BROWN. ESPECIALLY DESIRABLE AS THIS IS USED FROM UNION-OCCUPIED NEW ORLEANS. As recently as 1993, the Ishikawa block was thought to be unique. 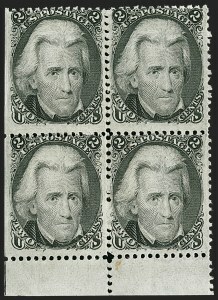 The three recorded used blocks are: 1) block of four, grid cancels, one stamp with corner crease ending in small tear, ex Ishikawa; 2) the block offered here, used from Union-occupied New Orleans, from our 1996 Rarities sale; 3) extensively rejoined and bleached to remove cancels (no longer appears used), offered in our Sale 847. FINE APPEARANCE. 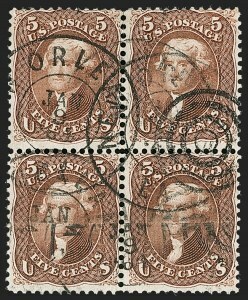 A RARE ORIGINAL-GUM BLOCK OF FOUR OF THE 24-CENT GRAYISH LILAC, SCOTT 78a. VERY FEW BLOCKS ARE KNOWN. 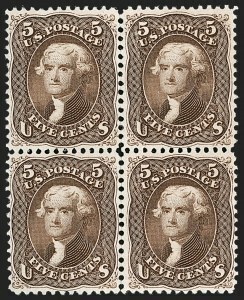 The 24c Grayish Lilac is an incredibly rare stamp in choice original-gum condition. It is also rare as a multiple, since most have been broken to feed demand for singles. We have offered only one other since 1994. EXTREMELY FINE STRIKE OF THE FAMOUS BRIDGEPORT FIREMAN FANCY CANCELLATION, WHICH WAS CREATED IN WATERBURY BY POSTMASTER JOHN W. HILL. 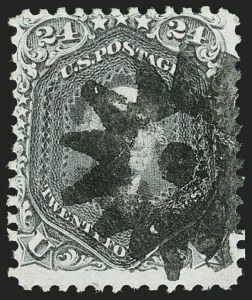 ITS USE ON A 24-CENT STAMP IS LIKELY UNIQUE. This cancel was inspired by the annual Bridgeport Fireman's Parade through Waterbury. 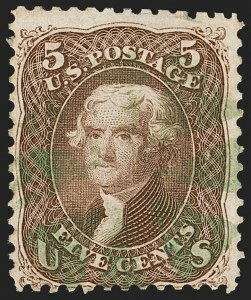 It is almost always seen on 3c stamps, though a few are known on 1c stamps or on a 3c entire. This use on a 24c stamp is truly remarkable -- we can only fantasize about what the cover must have looked like. Ex Hessel and Jennings. With 1976 P.F. and 1994 P.S.E. certificates. FRESH AND FINE. 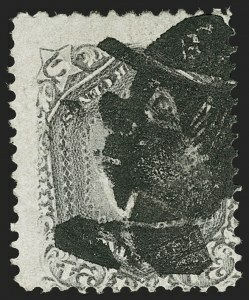 A SCARCE SOUND USED EXAMPLE OF THE 24-CENT BLACKISH VIOLET, WHICH IS ONE OF THE MOST DIFFICULT STAMPS TO ACQUIRE IN SOUND CONDITION. 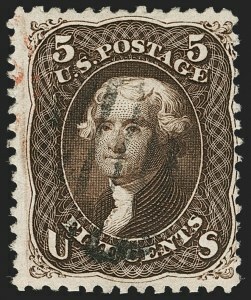 Our census of Scott 78c, available at our website at https://siegelauctions.com/census/us/scott/78c , records a total of 47 used examples of this issue. We also record nine on cover plus three unused. Approximately a dozen used copies are sound. VERY FINE APPEARANCE. A RARE EXAMPLE OF THE 24-CENT BLACKISH VIOLET, WITH CHOICE CENTERING, AND IN ESSENTIALLY SOUND CONDITION. FINE APPEARING EXAMPLE OF THE RARE ATHERTON SHIFT, THE MOST PRONOUNCED OF THE BLACK JACK DOUBLE TRANSFERS. ESPECIALLY DESIRABLE WITH THE WIDE TOP MARGIN, WHICH COMPLETELY SHOWS THE VARIETY. According to the Allen book, the Atherton shift got its name from Stanley Ashbrook, who first discovered it in the summer of 1923 in the collection of J. P. Atherton. 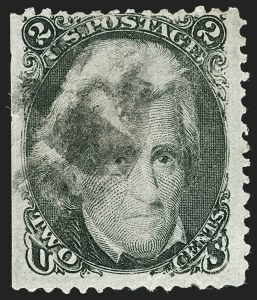 Concerning this double transfer, Mr. Ashbrook wrote: "Here we have one of the most remarkable double transfers on U. S. stamps that I have ever seen. I have for years classed the One Cent 1851, Type II, 89R2, as the No. 1 among remarkable examples of this variety and in my opinion this 2c Black Jack could well rank as No. 2. Perhaps some would even rank it equal to the 1c..." He stated further that it was his opinion, supported by other authorities whom he had consulted, that the variety must surely have come from an early or first condition of one of the plates, and that later it had been burnished out and a fresh entry made. The fact that every line in the Atherton Shift "is razor sharp" led him to conclude that the plate from which it came was very new. 2c Black, Preston Shift (73 var). 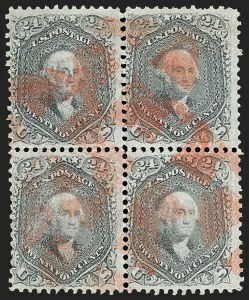 Block of four with bottom selvage and left interpane margin, Positions 81-82/91-92R30, original gum, barely hinged, strong offset perpendicular to the stamps, top left stamp Position 81R30 clearly shows doubling along the entire right side, especially in the numeral "2" and the acanthus leaf below and in "Cents"
FINE. AN EXTREMELY RARE EXAMPLE OF THE FAMOUS BLACK JACK PRESTON SHIFT. VERY FEW ARE KNOWN, AND THIS EXAMPLE IN A PLATED MULTIPLE IS THE FINEST AND MOST IMPORTANT. Little has been written about the Preston Shift -- a search of the Chronicle database turned up nothing. The best source is the Allen Black Jack book (p. 125), which states the "shift" was originally noted by Marvin Preston of Ferndale, Michigan. 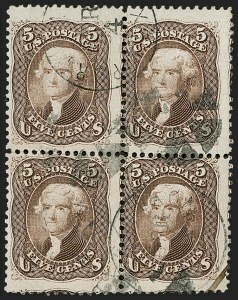 In a letter to J. David Baker, columnist for Stamps, Preston explained: "I was amazed, while perusing a dealer's stock in 1951, to discover this outstanding major double transfer." In 1953 Stanley B. Ashbrook wrote "This is a double transfer of the 'Black Jack' which is very rare in my opinion. It is the only copy that I have ever been able to find and is evidently much scarcer variety than the well-known 'Atherton Shift.' I communicated with a number of the leading students of this stamp thru-out the country and none of them had ever seen a copy of this variety. 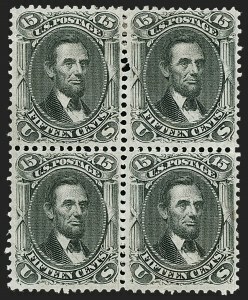 The following were consulted: H. P. Atherton, Anthony Russo, the late Ignatz Reiner, W. H. Kiefaber and Maurice Cole, author of a book on the stamp. These as well as a number of prominent dealers. 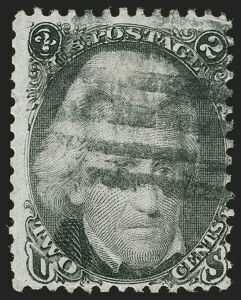 It does seem strange that none of the above had ever seen a duplicate of this stamp." 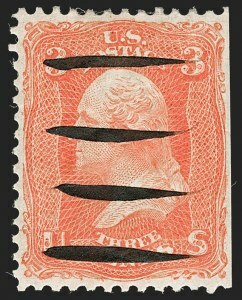 The Allen collection contained the discovery single, which was perforated on all sides and with perfs strongly cutting into the design at top. The cover offered in our recent sale of the Faust Collection was also in the Allen collection but went unrecognized as the Preston Shift. None were offered in the Rorke sale. Richard Drews showed a used single with straight edge at left in a talk at the Collectors Club in 2010 (offered in the following lot). Barbara Fosdyke-Ray owned a used single with perfs strongly cutting into the design at bottom and straight edge at left. The multiple offered here, with sheet margin and wide interpane margin, is the finest we have encountered and is especially desirable since it identifies the position of the Preston Shift on the plate. FINE. A RARE USED EXAMPLE OF THE 2-CENT BLACK JACK WITH THE PRESTON SHIFT. VERY GEW ARE KNOWN. 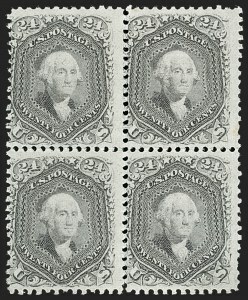 The Allen collection contained the discovery single, which was perforated on all sides and with perfs strongly cutting into the design at top. The cover offered in our recent sale of the Faust Collection was also in the Allen collection but went unrecognized as the Preston Shift. None were offered in the Dr. Rorke sale. Barbara Fosdyke-Ray owned a used single with perfs strongly cutting into the design at bottom and straight edge at left. We offered an original-gum block of four containing the variety in our 2016 Rarities of the World sale, which is offered in the previous lot. VERY FINE APPEARANCE. A RARE ORIGINAL-GUM BLOCK OF FOUR OF THE 15-CENT LINCOLN 1866 ISSUE. This is the first block of any size we have offered since our 2004 Rarities sale, when we offered the largest known multiple, a block of twelve. This is the first block of four we have offered since 1997.